Ulster Bank has said that the backlog of payments caused by technical problems during the week is taking longer than expected to clear. The bank has said it cannot say when the issue will be fully resolved. The bank had promised that accounts would be fully operational on Monday, but it now says that deadline is unlikely to be reached as the backlog is taking longer than anticipated to clear. In a statement this evening, the bank also said a small number of ATMs and online services have also been interrupted. Many of its branches had opened for extended hours today to deal with the fallout from the issue. A number of branches will also open tomorrow, while the bank continues to process payments over the weekend. It has said it hopes to have the software problem, which came to light on Wednesday and stopped the processing new payments into and out of accounts, fully resolved by Monday. About 60 bank branches around the country were open for extended hours until 3pm earlier today. There are 20 branches that will open tomorrow until 1pm. Ulster Bank customers expecting payments can bring ID and a payslip or welfare details to receive money. Customers of other institutions have been urged to contact their own banks, which should facilitate them with an overdraft without fees. In a statement to RTÉ News, the Central Bank has said it was working closely with Ulster Bank. The Central Bank has said that it wants to ensure the current situation is addressed quickly. It also said that it wants to ensure that the bank’s customers, and those of other banks, are treated appropriately. The Central Bank said it has had regular contact with the Ulster Bank incident team to keep appraised of the situation at the bank. 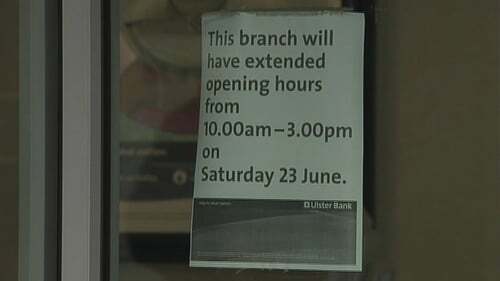 Ulster Bank has published notices in national newspapers giving details of branches that were open today and tomorrow to deal with customer queries and urgent transactions. Anytime Internet and Mobile Banking services are available, but they are reflecting a delay in updating customers' balances. The bank is also posting updates on its website on the progress being made in correcting the fault and giving details of branches and their opening hours this weekend.